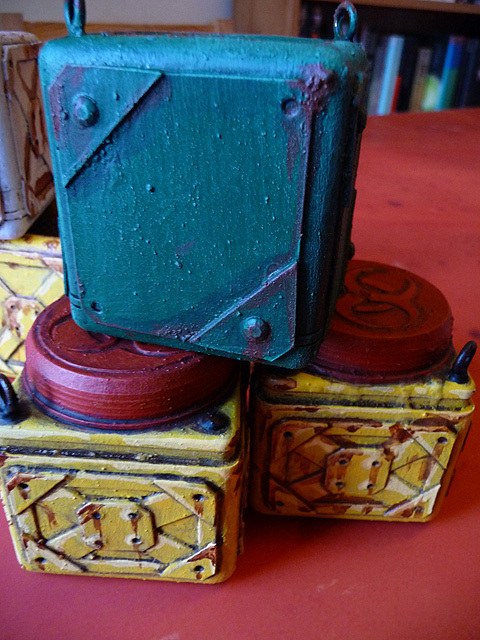 Confessions of a 40k addict: 40k future container scatter terrain - UPDATE, AGAIN! 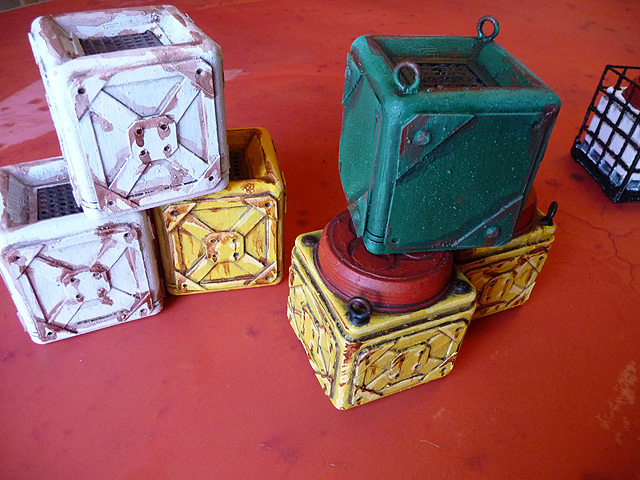 40k future container scatter terrain - UPDATE, AGAIN! As promised in my last update on 40k future container scatter terrain here's an update on the 7 further containers I produced. 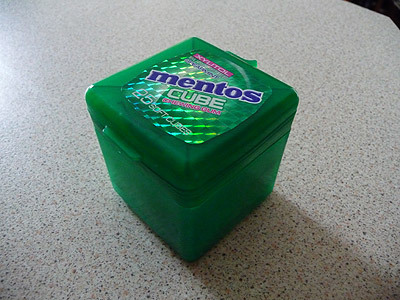 Before I begin though lets remind ourselves of the wonderful Mentos Cubes donor skeleton. And here's the first tutorial that showed how to make them. 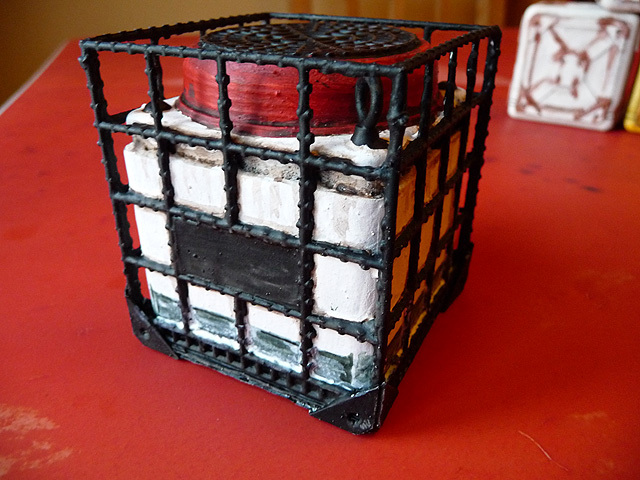 First up is my liquid container encased in wire mesh. Firstly I removed the lid and used a poster tube cap to create a new lid. I got some circular 'granny grating' to go on the top. Two corners had brass picture hooks for lifting, the other two corners had some crafting gems, octagonal shaped, they look like ornate rivets/bolts. 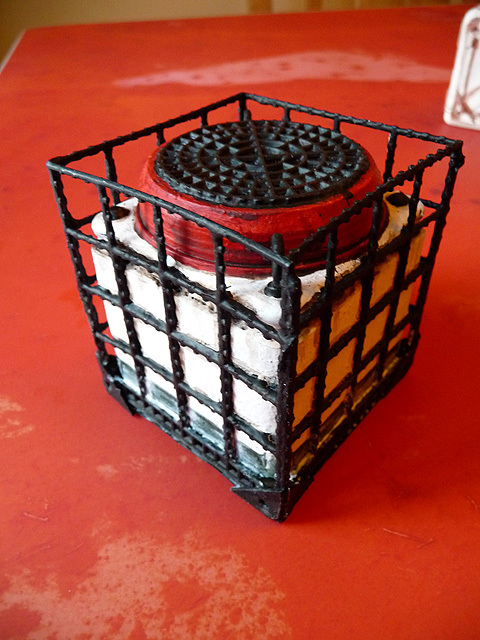 Then I got some 'granny grating' and judiciously removed chunks of it to get a mesh size suitable to fit the cube. As you can see some of the grid that was cut out leaves behind stubs but I like this, it makes it look more like rebar, it's more texture at least. I also added some corrugated cardboard on the base so it looks like it's on an integral pallet. The mesh had to have some bits of wire tied round it to ensure the mesh box stayed together but plenty of PVA 'welding' is holding it together. There are also corner supports on the base. Still got to finish the painting, silver on the mesh and rust effects. Not overly keen on my semi transparent plastic with stagnant green liquid inside but there's not much I can do. Below is the Dark Angel Container, reinforced at opposite corners with some more octagonal shaped crafting gems for rivets. First level of rust applied, orange still to add and metallic scrapes. Also DA chapter markings. Here's the Biohazard containers. The two with caps on are obviously the right way up. I removed the lid and used a poster tube cap to create a new lid. 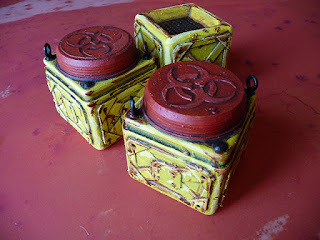 I used a template to cut out the Biohazard symbol for one lid and used the blank for the other. Two corners had brass picture hooks for lifting, the other two corners had some crafting gems. The third container is the usual upside down reinforced version with 'granny grating' on the top. Not 100% convinced on the yellow, but as it's not finished yet hopefully the orange rust still to add, metallic scrapes and markings should tone them down a little bit. Lastly a group shot with the two OOCL containers. Again the rust is a bit overpowering and it's not quite as beige as I'd hoped but we'll reserve judgement until they're complete. Still not sure if keeping them to fewer colours would have worked better, time will tell. There's still a little something missing in the paint-jobs, they certainly don't have the realism of my turquoise containers, but I have to recall my fundamental law of painting - 'reserve judgement until complete'. So many times I've been unhappy about a model's progress only to be overjoyed at the final results. The original containers themselves went through this process and came out alright, their siblings deserve the same chance. .pdf templates for the reinforcements if anyone wants to give it a go. Of course you miss out on a whole lot of gum and the fun of making them but it's another option. Just how many Mentos do you eat, anyway?